It will be led by Mike Pence and Kris Kobach, who have a very long history of making it harder to vote. Two days after firing FBI director James Comey and creating a full-blown constitutional crisis, Donald Trump signed an executive order today creating a presidential commission on “election integrity,” based on his debunked claims that millions voted illegally in 2016. Vice President Mike Pence will be the chair and Kansas Secretary of State Kris Kobach will be the vice chair—two men with very long histories of making it harder to vote, especially Kobach. Given the lack of evidence of voter fraud, the commission seems designed for one purpose: to perpetuate the myth of fraud in order to lay the groundwork for enacting policies that suppress the vote. If you want to know what such voter intimidation looks like, take a look at Pence’s home state of Indiana, where state police in October 2016 raided the offices of a group working to register African-American and low-income voters. They seized thousands of voter-registration applications, even though only 10 were suspected to be fraudulent and no one has been charged. In Kansas, Kobach has been the driving force within the GOP behind policies that erect new barriers to the ballot box and the most fervent evangelist of unproven voter-fraud claims. When Trump tweeted on November 27 that “I won the popular vote if you deduct the millions of people who voted illegally,” White House advisers cited Kobach as a key source of the discredited claim. 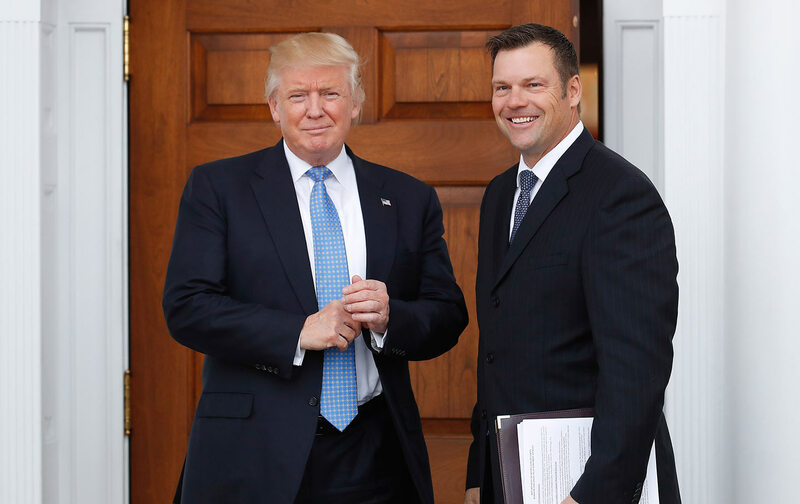 When he ran for secretary of state of Kansas in 2010, Kobach alleged that “the illegal registration of alien voters has become pervasive,” even though there were only five alleged cases of noncitizens voting in Kansas during the previous 13 years on a report of 221 “incidents” he distributed widely. According to a 2006 survey by the Brennan Center for Justice, 7 percent of Americans “do not have ready access to citizenship documents,” but a much larger number don’t carry those documents around with them, which made it impossible for groups like the League of Women Voters to register voters in Kansas. If Trump followed Kobach’s advice and pushed for policies like requiring documentary proof of citizenship for voter registration nationwide, it would have a massively suppressive impact on voting in America. Just yesterday, as part of a lawsuit by the ACLU challenging Kansas’s proof of citizenship law, a federal judge ordered Kobach to produce documents by Friday that he shared with Trump after the election that called for purging the voting rolls and amending the National Voter Registration Act to require proof of citizenship for registration. When he met with Trump on November 21, Kobach was photographed holding a white paper that advocated for a wish list of radical right-wing policies, including “extreme vetting” and tracking of “all aliens from high-risk areas,” reducing the “intake of Syrian refugees to zero,” deporting a “record number of criminal aliens in the first year,” and the “rapid build” of a wall along the US-Mexico border. Voter suppression is a much bigger problem than voter fraud. The 2016 election was the first in 50 years without the full protections of the Voting Rights Act and fourteen states had new voting restrictions in effect for the first time. On Tuesday I wrote about a new study finding that 200,000 votes could’ve been suppressed by Wisconsin’s strict voter-ID law in 2016. In comparison, Wisconsin didn’t present a single case of voter impersonation in court that the law would’ve stopped. We’re at a very dangerous moment for democracy right now, when the core institutions of our democratic system have repeatedly been attacked by the president of the United States. The director of the FBI was fired; Trump is under FBI investigation; our elections were hacked by a foreign autocracy; judges have been denounced by name; the media is called fake news. And now votes are being suppressed. Saving American democracy is the most urgent fight of the Trump era.